Opal is one of the best-flavoured early plums - indeed it is sometimes called a gage-like plum thanks to the excellence of its flavour. However the flavour depends crucially on developing sugars during the short growing period, and in the UK and northern Europe Opal really benefits from being grown against a south-facing wall or in a sunny aspect. In less favourable situations it will still give good crops but with a less intense flavour. The fruit is medium-sized, coloured dusky red with a heavy bloom, becoming blue when overripe. The plums ripen over a period of about 1-2 weeks, so you don't have to deal with a glut. The flesh is straw-yellow and fairly juicy. Opal is a semi-freestone plum - the stone falls away fairly easily from the flesh. If picked on a warm July day and placed in a fruit bowl Opal also has a wonderful aroma. This primarily a plum to eat fresh, but it is also useful for jams and fruit crumbles. We recommend Opal because it is easy to grow in a variety of climates and provides good quality plums early in the season. 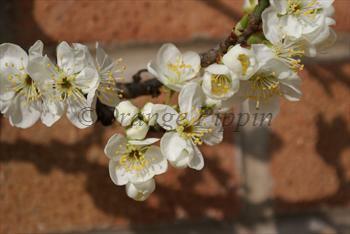 Please fill in the details below and we will let you know when Opal plum trees are back in stock. One of the parents of Opal, Oullins Gage is not quite as heavy-cropping but has an even better flavour. Like Opal, an early variety, better for culinary uses. Another early variety, not quite as good for eating fresh but better for cooking. Related to Opal, and a good choice for cold climates. Opal is in flowering group 3. Opal is self-fertile and does not need a pollination partner, although fruiting may be improved if there is a compatible tree of a different variety nearby. Since it flowers in the middle of the blossom season it can be pollinated by most other plum trees. Opal is very easy to grow, and crops reliably, so it is a good choice for almost any situation. However to really develop its flavour potential there are two simple things to consider. Firstly, it re-pays planting in a good sunny aspect. Growing as a fan along a south-facing wall will get the best results. Secondly, Opal has the potential to produce a heavy crop, and in a good spring it is likely that too much of the blossom will set fruit. This will lead to a very large crop of very small plums which will lack flavour. If this seems to be happening, thin the fruitlets towards the end of May so that there is one plum per cluster, with about 2" / 5cm or so between each plum. 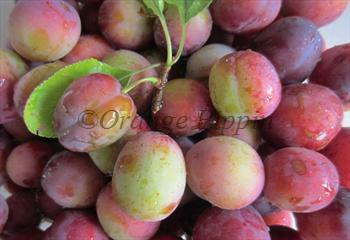 Thinning plums is a tedious business, but you won't regret it as the ones left will be bigger and with better flavour. Opal is a very winter hardy tree and a good choice for all areas of the UK. Opal was developed in Sweden in 1925 from a cross between Oullins Gage and Early Favourite.